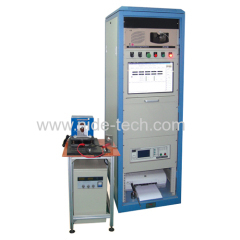 this testing machine is used to test stator performance, like insulation resistance. 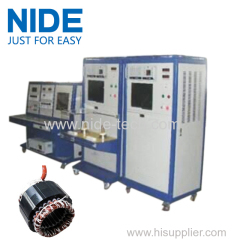 The electric motor stator tesing machine is use for tesing the stator about HV,insulation resistance,DC resistance,surge test.Each test. 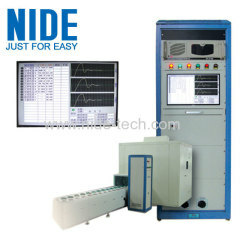 This tester is applied to type test of every kinds of single phase, three phases AC and DC motor. 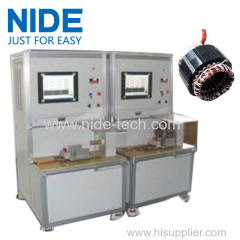 1.This tester is applied to integrated test varieties of automobile motor, wiper motor, window lifting motor etc. This machine is applied to test steel casting motor such as pump, compressor, air condition motor and washing machine motor etc. 1. Tester Max dimension: 850(width)*950(depth)*1870(height). 2. Two working position could rotary test. 3. Computer system with CPU1.3G. 1. Motor comprehensive testing panel,surface plastic blast, white color computer. 2. 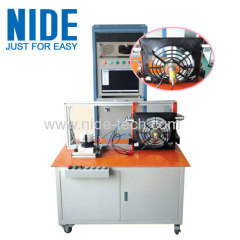 Electric cabinet in good ventilation condition and mouse proof. 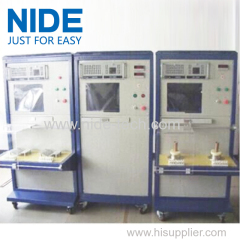 Group of Stator testing machine has been presented above, want more	Stator testing machine and Stator testing panel, Please Contact Us.